What made fashion become as we understand it today is a series of completely revolutionary events, carried forward by emerging but far-sighted personalities. One of the most representative of these moments is the launch in 1959 of Pierre Cardin’s first prêt-à-porter collection, which cost him the expulsion from the Chambre Syndacale de l’Haute Couture Parisienne. Pietro Cardin was born in 1922 in Sant’Andrea di Barbarana, a hamlet of San Biagio di Callalta, near Treviso and Venice, in the north of Italy. He is considered both an Italian and French national fashion designer, as parents were forced to move to France in 1924 due to the poverty brought by the First World War. In France Cardin began his apprenticeship with a tailor in Saint-Étienne and after a brief experience, he became a tailor in Vichy; in 1945 he arrived in Paris working first for Jeanne Paquin and then for Elsa Schiaparelli. He was the first tailor of the Christian Dior maison during its opening in 1947 (after being rejected by Balenciaga) and was a participant in the success of the master who defined the New Look. In 1950 Cardin founded his own fashion house, then venturing into high fashion in 1953. What has always characterised him was his experimental taste for avant-garde, the space age and unusual fabrics such as vinyl (at the time considered sacrilegious), or a taste that led him to prefer geometric shapes that very often did not appear follow the lines of the body and its natural movements. After progressing in unisex fashion, in 1959 he opened a high fashion shop in Japan and in that year he launched a collection for the first time in the history of fashion for the Printemps department store in Paris. Since the term – and the concept as a whole – of prêt-à-porter did not yet exist, Cardin was expelled from the Chambre Syndacale for having transgressed the imposed norms. Pierre Cardin, however, was immediately reintegrated, probably thanks to the reactions of his colleagues, who felt themselves the drive towards change, but he decided to resign in 1966; since then he showed his collections first at the “Ambassadors’ Theater” near the American Embassy, ​​later at his “Escare Cardin” headquarters opened in 1971 in Paris, where artistic talents, as performed and musicians, are still promoted today. 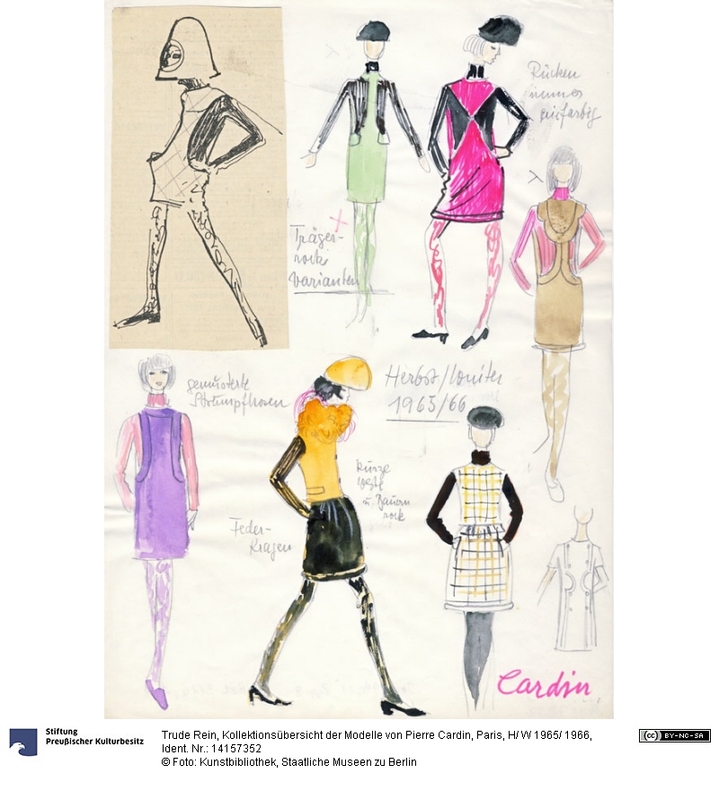 Cardin was a member of the Chambre Syndicale de la Haute Couture et du Prêt-à-Porter and of the Maison du Haute Couture from 1953 to 1993; in 1994 he decided to show his creations only to a select group of selected clients and journalists. The first license contract in clothing between a fashion designer and a French company was signed, therefore, by Pierre Cardin, to promote a women’s ready-to-wear collection. This was to the advantage of the fashion designer, who in doing so could secure the production capacity, so much so that from the seventies onwards, especially in Italy, the licensing phenomenon spread more and more, until the 90s, when it began to safeguard the name of the fashion house. Over the years, Cardin stipulated more than 900 licenses and its brand arrived in over 140 countries. But his design philosophy was far from the productive and commercial mechanisms, as he always stated that he did not want to be a label, but a brand; this meant turning to those who shared his taste: so it was necessary to address the crowd. At the end of the 1950s, he felt that fashion was approaching a new kind of people and had to be able to address them; fashion could now and must have been both a creative process and a business, and a man, Pierre Cardin, could play an excellent businessman and an excellent artist at the same time. It was therefore this kind of events that brought to light what is still the struggle between haute couture and prêt-à-porter, a conflict that is at the base of what is now fashion for us. The revolution brought by Cardin and followed by many other fashion designers is not just about economic strategies, but uses them to convey a message, a new – personal and commune – vision.